(21112.421, Robert Snodgrass Collection, OHS). (5511, Matt Duhr Collection, OHS). Fiddling arrived in the Indian Territory during the 1830s and 1840s with the resettlement of the five Southeastern tribes. Indians and intermarried whites brought the string tradition with them. By the time of the Civil War the fiddle had become the most popular instrument in Oklahoma. In the later nineteenth century local fiddlers also received inspiration from musicians in traveling shows from the eastern states. The old-time fiddler was regarded as an asset to a community, providing music for celebrations and for dances. In the late 1800s some condemned the instrument as "the Devil's box," but the field of good fiddlers kept growing. Most played "by ear," in contrast to violin players, who relied upon written music. 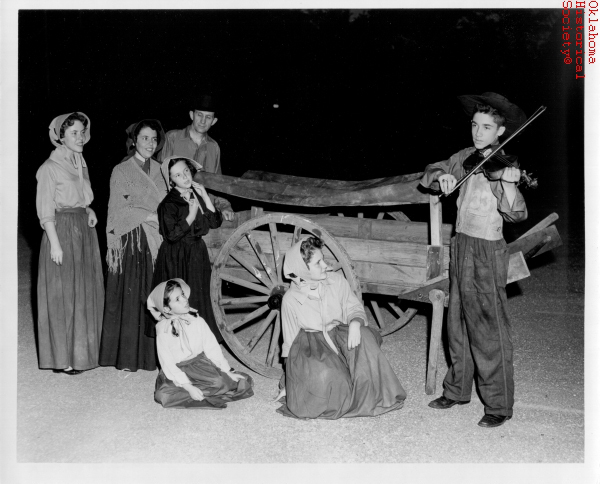 Early fiddle music came almost entirely from Anglo traditions (from the British Isles), with other European influences occurring as Oklahoma's population became more diverse. However, styles of fiddling were clearly associated with Indian populations and other regional influences and were often identified as "Ozark," "Cherokee," "Creek fiddle dance," and so forth. By the late 1800s contest fiddlers were common, performing very complex or stylized versions of traditional tunes or original tunes. Exceptional musicians, these men played as an avocation and belonged to "old-time" fiddle clubs. In the early 1900s "West Texas" or "Panhandle" styles inspired musicians such as Bob Wills and led to the development of swing styles. At the same time some the fiddle playing of African Americans from Oklahoma began to approach swing and jazz. A notable swing/jazz player named Claude "Fiddler" Williams began his musical career in the 1920s in a black string band from Muskogee. Oklahoma's first fiddle recording appeared on the Victor label in 1922, performed by Henry Gilliland of Altus, accompanied by Eck Robertson of Vernon, Texas. By the late 1920s Oklahoma had many fiddlers playing in ensembles of fiddle, banjo, mandolin, and guitar. This occurred in the context of the American string band era of the 1920s and 1930s, a time when fiddling traditions were incorporated into rural dance bands, medicine, and minstrel shows. Otto Gray and His Oklahoma Cowboys exemplify the string band craze. By the 1950s Oklahoma fiddling had faded in popularity and was limited to the influence of Bob Wills's style. Eventually, a few musicians began to emerge as bluegrass fiddlers in the late 1960s, with Byron Berline leading the way. Several Oklahomans, including Herman Johnson and Buster Grass, have excelled in national fiddle contests. Contemporary players such as J. C. Broughton, Byron Berline, and others have continued to advance swing and bluegrass, and Stillwater-born Brad Leftwich has preserved and expanded Ozark and other traditional styles. Since World War II organizations such as the Oklahoma Fiddlers Association have promoted both contests and conventions where artists from Oklahoma and the region could come together. Documentation of Oklahoma fiddling is most notably represented by Marion Thede in The Fiddle Book. Most of Thede's documentation and examples come from her 1950s fieldwork in Oklahoma. In 1984 Oklahoma's legislature named the fiddle as the official state instrument. By 2000 fiddling had enjoyed a revival, with more styles being played than ever before. Arkansas (Van Buren) Intelligencer, 10 May 1845. Byron Berline, Interview by Rodger Harris, Oral History Collection, Research Division, Oklahoma Historical Society, Oklahoma City. J. Justin Castro, "From the Tennessee River to Tahlequah: A Brief History of Cherokee Fiddling," The Chronicles of Oklahoma 87 (Winter 2009–10). Rodger Harris, "Wars With the Fiddle and Bow [typescript]," Harris Collection, Research Division, Oklahoma Historical Society, Oklahoma City. Marion Thede, The Fiddle Book (New York: Oak Publications, 1967). Marion Thede Collection, Research Division, Oklahoma Historical Society, Oklahoma City. Claude Williams, Interview by Rodger Harris, Oral History Collection, Research Division, Oklahoma Historical Society, Oklahoma City. Charles K. Wolfe, The Devil's Box: Masters of Southern Fiddling (Nashville, Tenn.: Country Music Foundation Press and Vanderbilt University Press, 1997). 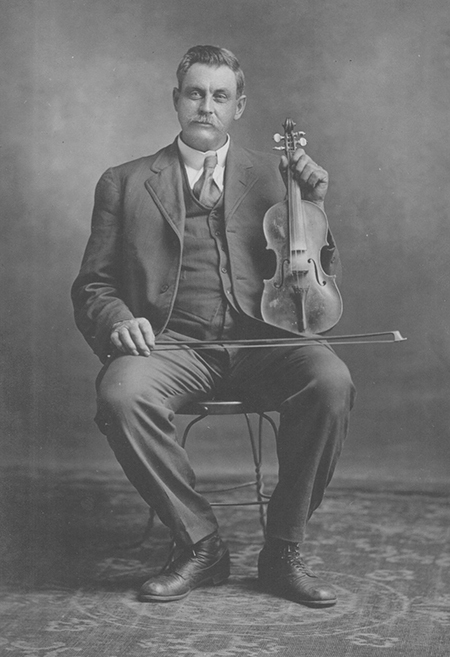 Rodger Harris, "Fiddling," The Encyclopedia of Oklahoma History and Culture, https://www.okhistory.org/publications/enc/entry.php?entry=FI001.